With a majority Conservative government in power, fresh questions are being raised over the future of Britain’s most beloved institution. RT asks: can the Tories be trusted with the NHS? A week later, while Miliband is taking a long overdue holiday in Ibiza, Tory minister Jeremy Hunt is assuming responsibility for Britain’s Department of Health for the second time. Labour’s manifesto included key pledges on the health service, such as injecting an extra £2.5 billion in funding to pay for 20,000 more nurses, 3,000 midwives and 8,000 GPs. Miliband also promised to repeal the controversial Health and Social Care Act – which further opened the door to privatization – and cap the amount of profit private companies can make from the NHS at 5 percent. With the Conservatives now in power, RT has approached leading voices in the debate around healthcare to find out what the next five years have in store for the National Health Service. Prime Minister David Cameron pledged to “ring-fence” the NHS budget last October if his party was re-elected. “The next Conservative government will protect the NHS budget and continue to invest more,” he told the Tory party conference in Birmingham. Alan Taman, spokesman for Keep Our NHS Public, told RT the public should reject such assurances and be very concerned about the future NHS budget. “NHS funding will of course change under this government … What worries us – and what we think should worry the British public – is how that altered spending will translate into how health services are provided. “We expect to see increased amounts going to private providers. And even more public money wasted in the costly and completely unnecessary burden of NHS organizations having to draw up tenders for contracts that shouldn’t have been put up for tender in the first place. “So ask not ‘how much is this government spending on the NHS?’ Ask ‘Why is this government committed to spending more for an idea which plainly does not work: running a market for health care?’” he added. Caroline Molloy, healthcare campaigner and Editor of OurNHS at OpenDemocracy, told RT the NHS has already suffered funding cuts despite Cameron’s promise to “ring-fence” the service’s budget. “He told us ‘I'll cut the deficit, not the NHS,’ but another recent study shows that payments to hospitals for treatments have been cut by 10 percent across the board,” said Molloy. Molloy said Cameron’s plan to roll out personal budgets which cap individuals’ healthcare entitlements resembles the ‘voucher scheme,’ which late-Prime Minister Margaret Thatcher wanted to “but didn’t dare” introduce. The privatization of the NHS didn’t begin under the Conservatives, but with Tony Blair’s New Labour. With the appointment of Alan Milburn as health secretary in 1999, New Labour began injecting business concepts into the health service that were previously alien. 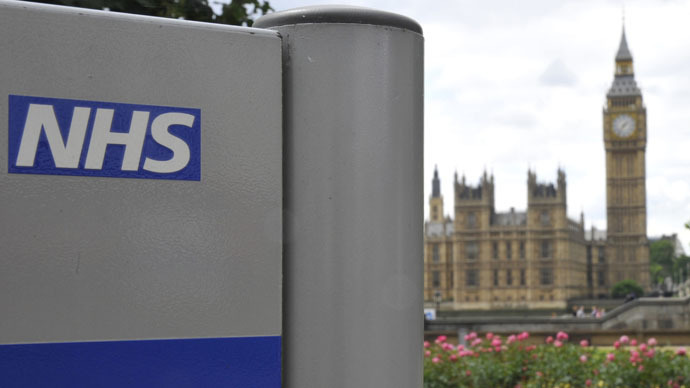 As retired GP and Primary Care Trust chair Kailash Chand wrote for OpenDemocracy: “The last Labour government laid the groundwork for everything that the [then] Tory-led coalition is now doing to the NHS. Milburn – who lines his pockets as a private healthcare consultant – was outspoken earlier this year in suggesting Miliband’s pledge to “reform” the NHS along similar lines. Taman, of Keep Our NHS Public, echoes Iacobucci’s prediction of further NHS privatization. “The tendency to contract out services to private providers preferentially will continue and NHS services will continue to be put under threat. Barrie Brown, National Officer of Health at Unite the Union, said staff in privatized sections of the NHS will not have the same pay and benefits of public employees. “We believe this is something that undermines the effectiveness of the NHS,” he told RT. With the NHS guaranteed to experience big changes over the next five years, the obvious question to ask is how will this affect its services? In order to gain a more accurate idea of what the future holds, Caroline Molloy looks to the past. “The 2012 Act abolished the government’s duty to provide a comprehensive health service which has existed since the foundation of the NHS in 1948, and last year we saw local health bosses propose refusing all routine operations to obese people and smokers,” she told RT. Taman is less certain of what the next five years of Tory majority rule hold for the health service. “Where we will be in 5 years' time is hard to predict. Because the NHS is not going to disappear all at once. No one is going to announce its demise,” he told RT.